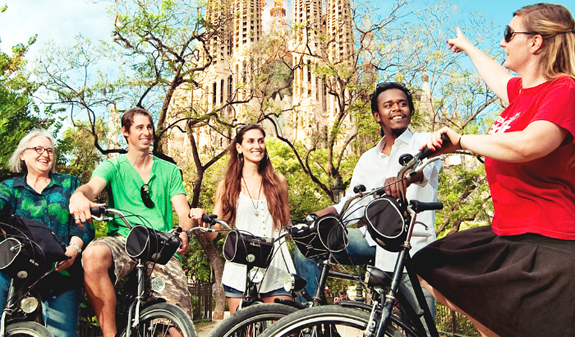 Discover the delights of Barcelona as you enjoy the freedom and excitement of exploring the city on a bike guided tour. 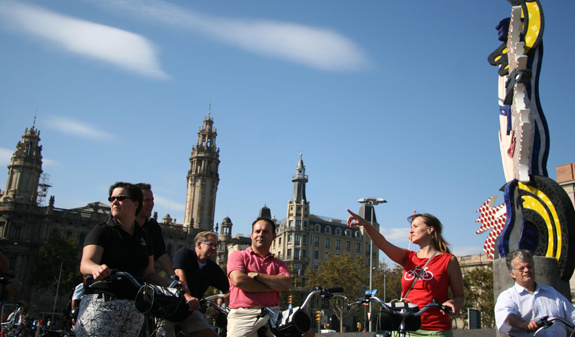 The team of guides will fill you in on the historic background, the experiences of everyday life in the city and its main landmarks on this relaxing bike guided tour. Discover the city as you pedal along on one of our comfortable bikes with our friendly guide who will tell you about the historic details, the fascinating experiences of everyday life in the city and its iconic landmarks and sights on this easy-going route. 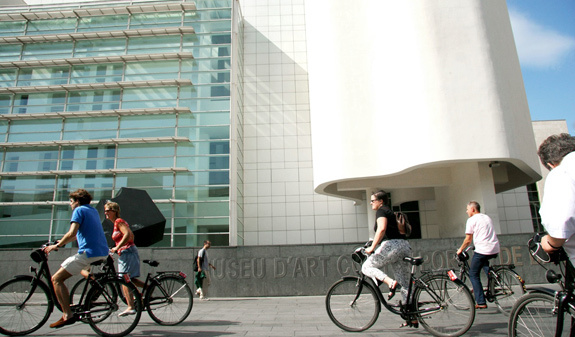 Go on a relaxing cycle tour of Barcelona and visit unique cultural sights such as the Museu d'Art Contemporani, in the Raval neighbourhood, which has its own Rambla with its own unique inhabitant, Botero's 'Cat'. 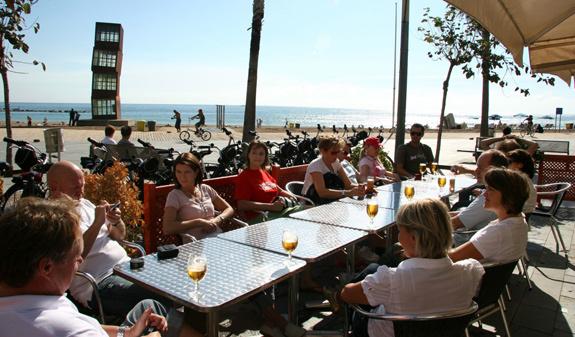 The guide will tell you some curious anecdotes about the neighbourhood and will then take you to the plaça Reial, the plaça Sant Jaume, the charming plaça de San Felipe Neri, the majestic Cathedral, the Roman walls and the plaça del Rei, among many other landmark sights. Next, you'll head down to the seafront and beaches where you'll be able to stop, time permitting. 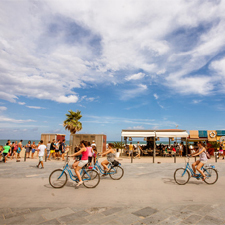 You'll visit the old harbour, the Port Vell, the Barceloneta district, the Olympic Marina and, on the way back, you'll cycle through the Parc de la Ciutadella and stop at the Sagrada Família. 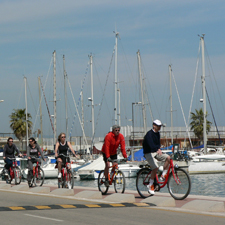 If you prefer the electric bike, daily at 2pm (from 15/5 to 31/10), enjoy the following tour: MACBA, el Raval, el Molino -Paral·lel, Montjuïc fountains, anella olímpica, Mirador de Miramar, Colom, Port Vell, Barceloneta, Port Olímpic, Sagrada Família, La Pedrera, Casa Batlló. And during the hot summer nights you'll also be able to go on one of our night-time tours! 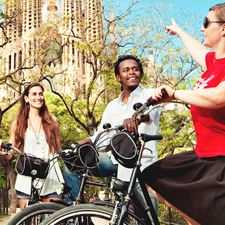 Exploring the city by bike is a wonderful way to experience Barcelona day or night. 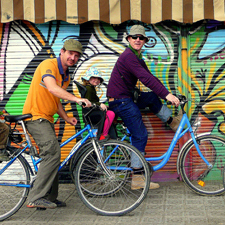 Three-hour bike tour with a guide. Bottle of water and stop at the beach. Front basket for your personal items. Morning Daily Tour: throughout the year (except 25th December and 1st January): at 11am. 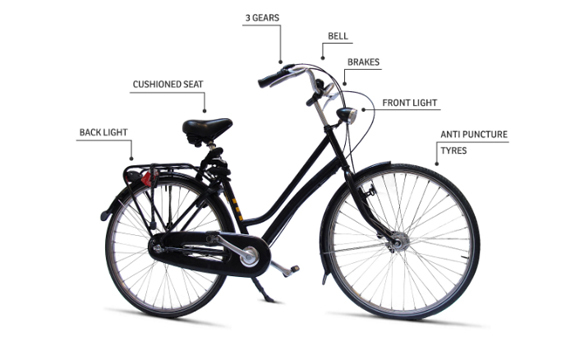 Electrical bike Daily Tour: daily at 2pm, from 15th May to 31st October. Afternoon Daily Tour: daily, at 4.30pm, from 15th April to 31st October, and Saturday and Sunday of November: at 4.30pm. Night Tour: 1st June to 30th September, from Thursday to Sunday: at 7.30pm. Departure point: plaça de Catalunya, at the door of Hard Rock Cafe. Metro L1 and L3, stop Catalunya. Bus 16, 17, 41, 42, 55 and 141. Designed for all age groups. Children under 15 must always be accompanied by an adult.